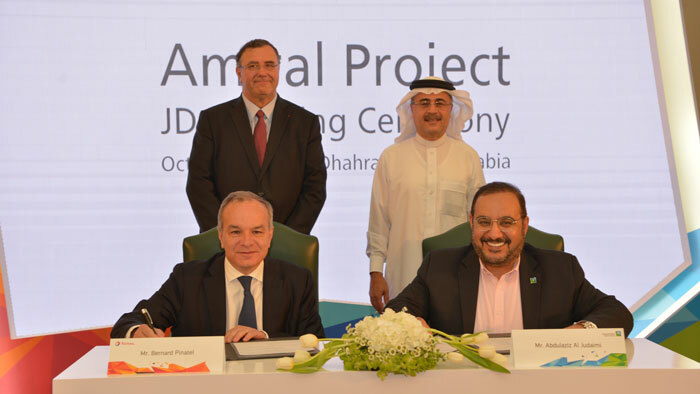 The joint development agreement for the frontend engineering and design (FEED) of a giant petrochemical complex in Jubail, on Saudi Arabia’s eastern coast was signed in Dhahran, Saudi Arabia, on Monday by Amin H. Nasser, president and chief executive officer of Saudi Aramco and Patrick Pouyanné, chairman and chief executive officer of Total. Announced in April 2018, the world-class complex will be located next to the SATORP refinery, operated by Saudi Aramco (62.5%) and Total (37.5%), in order to fully exploit operational synergies. It will comprise a mixed-feed cracker (50% ethane and refinery off-gases) – the first in the Gulf region to be integrated with a refinery – with a capacity of 1.5 million tons per year of ethylene and related high added value petrochemical units. The project represents an investment of around USD5 billion and is scheduled to startup in 2024. The project will provide feedstock to other petrochemical and specialty chemical plants located in the Jubail industrial area and beyond, representing an additional USD4 billion investment by third-party investors benefitting to the Saudi economy. The overall complex will represent an investment of approximately USD9 billion and is expected to create 8,000 local direct and indirect jobs. “SATORP’s second-phase expansion represents a quantum leap in Saudi Aramco’s downstream strategy to maximize our hydrocarbon resources and help position the Kingdom as a chemicals manufacturing hub, thus supporting economic diversification. Today’s signing will deliver on multiple levels, from high-value fuels and petrochemical products for consumers on three continents to meaningful job creation and local content development. We’re pleased to celebrate with Total this latest milestone in the SATORP journey,” Nasser said. “We are delighted to write a new page of our joint history by launching a new giant project, building on the successful development of SATORP, our biggest and most efficient refinery in the world. This world-class complex also fits with our strategy to expand in petrochemicals by maximizing the synergies within our major platforms, leveraging low-cost feedstocks and taking advantage of the fast-growing Asian polymer market,” Pouyanné said. The Saudi Aramco Total Refining and Petrochemical Company (SATORP), the first such joint venture between the two energy companies, was established in June 2008 to build a refining and petrochemical complex in Jubail II industrial city. The refinery, whose capacity increased from 400,000 barrels per day (bpd) of crude oil at its startup in 2014 to 440,000 bpd today, is recognized as one of the most efficient in the world.